Montgomery County has developed an advanced microgrid at its public safety headquarters and correctional facility that will improve the resiliency of government operations, reduce greenhouse gas emissions, upgrade existing aging electric infrastructure without capital expenditure and control energy costs. 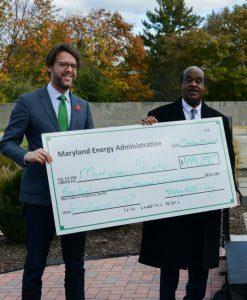 This project is partially funded by two grants from the Maryland Energy Administration (MEA) totaling $494,250 dollars. “Expanding emergency relief options for residents impacted by a power grid outage is a paramount health and safety issue,” stated Mary Beth Tung, MEA Director. “The State of Maryland has a dedicated network of agency offices who partner with utility companies and local organizations to address public needs. This microgrid project encompasses Combined Heat and Power (CHP) systems and Solar Parking Canopies with EV chargers, and is an excellent example of the State’s strong public-private partnerships,” concluded Tung. This microgrid project increases the amount of clean energy generated by both facilities leveraging solar parking canopies and natural gas CHP systems. Each facility will be able to generate enough energy to run independent of the power grid during emergencies. The total energy production between both sites equals over 11 million kilowatts per year which is enough energy to power 750 homes. Anticipated greenhouse gas emission reduction is 6,800 metric tons annually which is equal to removing 1,400 cars off the road or planting 178,000 trees. Click here to see a video from the day’s proceedings. The Montgomery County Public Safety Headquarters’ microgrid achieved Performance Excellence in Electricity Renewal (PEER) certification from Green Business Certification Inc. (GBCI) and is the first Maryland project and public safety headquarters to certify. PEER is the world’s first certification program that measures and improves power system performance and electricity infrastructure. 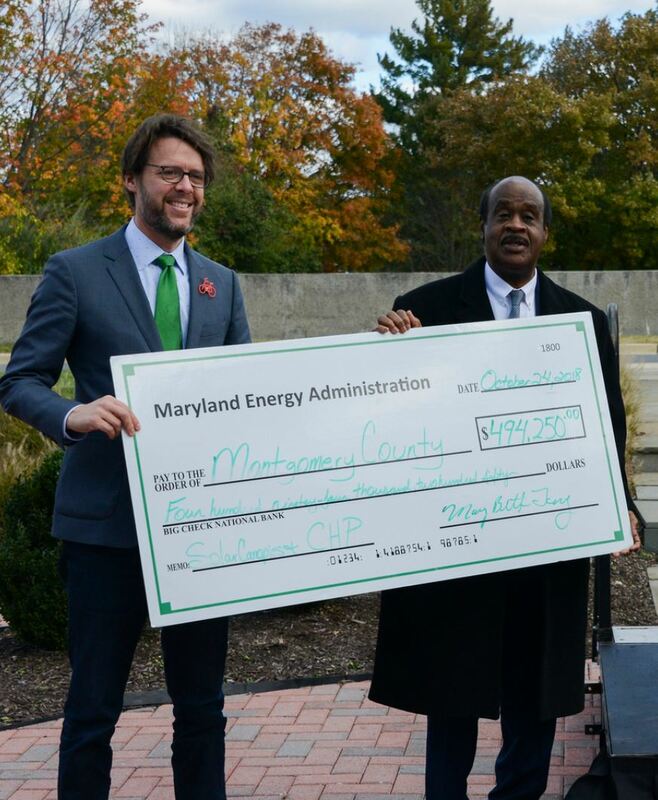 Montgomery County Council President Hans Riemer and Montgomery County Executive Isiah Leggett hold check from MEA for $494,250 that helped pay for elements of the microgrid. A key component to this project is the CHP system which generates electricity and useful thermal energy in a single, integrated system. CHP systems combine technologies to maximize energy efficiency and reduce waste. In traditional fossil fuel power plants, two-thirds of the energy used to generate electricity is wasted in the form of heat discharged to the atmosphere as well as through electricity transmission, achieving a combined efficiency of only 33 percent. By combining electricity generation and waste heat capture, CHP systems can operate at levels as high as 80 percent efficiency. A total of 44 businesses, nonprofits and local governments in Maryland have received CHP grants. The Maryland CHP projects represent over 63 megawatts of new, resilient energy generation within the state. “Things are not, and cannot, be single-use anymore. 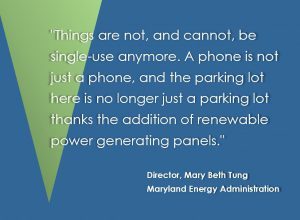 A phone is not just a phone, and the parking lot here is no longer just a parking lot thanks the addition of renewable power generating panels,” stated Director Tung. Montgomery County Public Safety team members use one of the EV chargers. The 2.5-megawatt capacity solar canopies cover the 9 acres of parking at the public safety headquarters and will generate an estimated 3.3 million kilowatts of energy which is enough to power 250 homes. 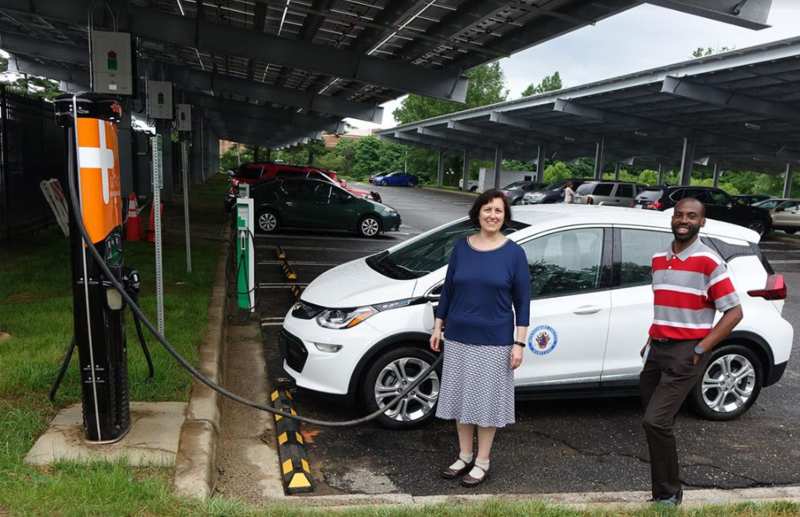 The State’s Solar Canopy Grant Program requires EV chargers for all projects and the public safety headquarters features ultra-fast level three chargers that cut traditional battery charging time in half. 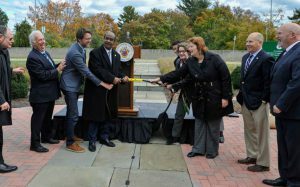 These EV chargers allow Montgomery County to grow its electric vehicle fleet and provide charging to employees and visitors. All of the EV chargers are powered by the microgrid which will function even if the overall electricity grid is down. 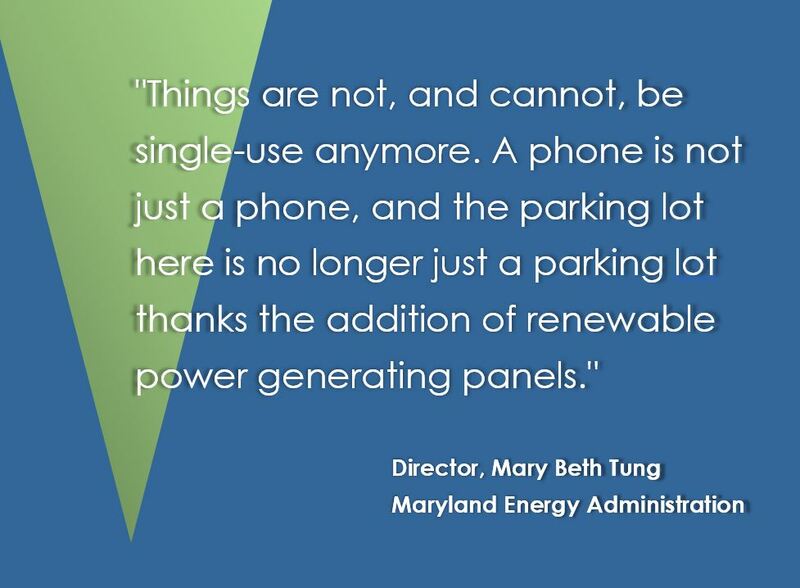 To learn more about the CHP or Solar Parking Canopy grant mentioned above, visit the MEA website, www.Energy.Maryland.gov or call 410-537-4000.